Edge Tech Corp, online at edgetechcorp.com, is a leading supplier of computer memory. With over 25 years in business, Edge Tech Corp offers DRAM, external hard drives, flash drives, solid state drives, and memory upgrades for every server, router, PC, laptop, Mac, or printer. Edge Tech Corp carries memory compatible with many manufacturers, including Acer, HP, IBM, Apple, Sony, Lenovo, Toshiba, Gateway, Dell, Compaq, and others. 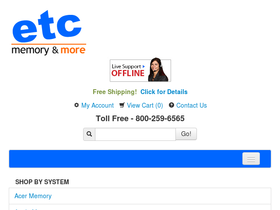 And with special offers, Edge Tech Corp is a great place to shop for memory. RetailSteal.com has all the latest edgetechcorp.com discounts, Edge Tech Corp promotions, and Edge Tech Corp coupon codes. Edge Tech Corp ships to the all 50 United States and Canada. Shipping rates are determined by shipping method and items shipped. See site for more details. Save 10% on any order from EdgeTechCorp.com. Click here and use coupon code to enjoy savings. Enjoy a $20 discount from Edge Tech Corp, and save on memory for PC, HP, Compaq, Sony, to more. Use coupon code with orders $200 or more. Shop at Edge Tech Corp and enjoy $5 savings on orders $50+. Click here for code. Save $5 from EdgeTechCorp.com. Click here to save on hard drives, flash drives, and more. Use coupon with purchases $50 or more. Enjoy free shipping standard shipping within the United States from Edge Tech Corp. Enjoy discount with purchases $50+. Shop for mini flash drives, starting as low as $5 for 1 GB, from Edge Tech Corp. Click here to shop. Go to Edge Tech Corp for DDR3 memory on sale. Click here to shop. Enjoy a 5% discount ram on compaq v5000 when you use this coupon code at Edge Tech Corp! Purchase a digital frame and receive a free gift when using this promo code at Edge Tech Corp.
Use this promo code at Edge Tech Corp and save $5 off 250gb external hard drive.